I served as a youth mentor for the Bitterroot Culture Camp which aims to bring together Salish youth of the Flathead Indian Reservation with non-Native youth who are currently inhabiting our traditional homelands. The camp encourages cultural exchange and understanding by teaching the Salish language, culture, and history. I served as the head community event organizer for Dartmouth’s 2016 Annual Powwow. I helped the general powwow committee draft contracts, manage budgets, and organize meetings to ensure the powwow ran smoothly. Through my sorority, I engage in philanthropy and service events that benefit WISE- Upper Valley. WISE is dedicated to ending gender based violence through survivor advocacy, education, prevention, and mobilization for social change. Amerra Webster-Yaqui is an enrolled member of the Confederated Salish and Kootenai Tribes from Ronan, Montana. She is a Gates Millennium Scholar and current senior at Dartmouth College where she studies Government and Native American Studies. While at Dartmouth, Amerra has interned for the Collegeâ€™s Native American Program where she focused on building and strengthening community for Native women at Dartmouth. Amerra has also participated in Indigenous-focused research by exploring the diverse reactions and responses of Tribes experiencing climate change in North America. As a Udall Foundation Intern for Senator Jon Tester, Amerra assisted the Senatorâ€™s Tribal Affairs legislative staff in addressing issues relevant to Montana Tribes, and Indian country more broadly, by researching relevant policies and drafting memorandums to inform staff. 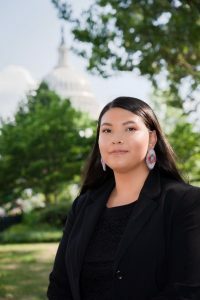 Amerraâ€™s academic, professional, and personal experiences have allowed her to explore her passions of defending tribal sovereignty and promoting self-determination. In recognizing her passions, Amerra realized that one powerful way she could help her community, and Indian country more broadly, was to pursue a career in public service. After graduation, Amerra will be working for her tribal government as a Lead For America Hometown Fellow. Ultimately, Amerra hopes to dedicate her life to public service to ensure a brighter and more just future for her community.